A girl who counts everything falls in love with an imprisoned alien. Ester Slade’s favourite number is 10 to the power minus 43 – Planck time. She likes to count things and has an extraordinary grasp of spaces. She used to be called dim, even stupid, but is brilliant at fixing things. She’s never told why the general selected her to fix the prisoner’s cell door but it soon becomes obvious. An alien from an opposing faction in the war, the prisoner holds the key to the moon’s destruction. Ester is told fourteen times not to look into his eyes – but what would happen if she does? Hello, she should say. Hello. That’s what people said. Hello. “I thought your ears would be pointed,” she said instead, suddenly, randomly, and then her hand was over her mouth, wondering why she had said that. “Did you?” he said, as if she had said something enormously interesting. One of the few Exodus stories that was relatively easy to write. Ester Slade turned up in my mind fully formed, right down to the ponytail. I found her voice quickly as well and could see exactly what she could see. It’s rare for me to find a character so easily and to be able to write so freely and quickly. It came as an immense relief after the intense difficulties of EXPERIENCED. Every story in the sequence is experimental in some way, whether in style or structure or shape. 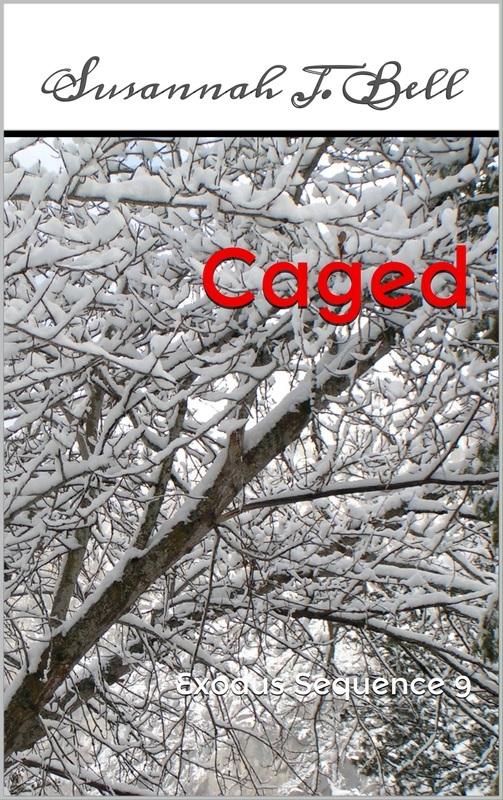 In CAGED I experimented with conversational structure: I didn’t use quotation marks or italics to indicate when someone was speaking, or hyphens (a literary style I loathe). This acted to blur speech with the story which I did deliberately to show the uniformly grey world that Ester inhabits. When she meets Trator, her world explodes into technicolour and now the conversation appears “normal” i.e. within inverted commas. CAGED is the last story in the first sequence. It connects to every other story that precedes it and reflects many of them. The loss of the moon is imminent (it was destroyed in WALKED). The war is well under way and the field around Mars is a key factor (CRASHED). The factions from REFLECTED are apparent and Trator should be recognisable from the same story. Ester’s feelings reflect the romance in WOKEN and Trator’s cage reflects the wire cages in WIRED. Trator mentions the Golden Queen, a name that has come up several times. “Scaping” has been performed by several characters though it hasn't been named until now. I also ask the question that was waiting in the wings: if something is invisible, how can it be there?